ALL OF HER CHAINPLATES HAVE BEEN REPLACED!! AND FROM HERE ON IT ONLY GETS BETTER AND BETTER! Undeniably, "Barefoot" is the finest Island Packet 40 on the market with her impressive list of sailing components, caring owners who maintain her without regard to cost or effort needed, and her being competently prepared for World-Wide cruising. Don't Miss the "Rest of the Barefoot Story". Please Click on the "Full Specs"
PREPARE TO BE VERY IMPRESSED! Many believe the Island Packet 40 to be the best of Bob Johnson's designs. This beautiful bluewater cruiser features spacious and liveable accomodations with a 2-head, 2-stateroom layout. The owner's suite is forward with a large pullman berth with mattress to starboard and private head with shower. The owner's suite features excellent ventilation and ample storage with bins and drawers underneath the berth plus bureau drawers and a cedar-lined hanging locker to port. Next aft is the spacious main salon with Island Packet's signature bulkhead-mounted fold-up table. The L-shaped settee to starboard pulls out to make a double berth. To port is a straight settee and cedar-lined hanging locker. The UltraLeather settee cushions were new in 2016. Aft is a nav station with large desk and instrument panel. The aft head follows to port and is accessible from both the salon and aft stateroom. To starboard of the companionway is the large galley with 3-burner propane stove with oven, double S/S sinks, refrigerator/freezer and ample storage. To port of the companionway is the entrance to the aft stateroom featuring extra large berth, storage bins and drawers and cedar-lined hanging locker. "Ship Shades" on all portlights provide privacy and sun protection. The engine is under the companionway and is easily accessible from all four sides. The cockpit is large and comfortable with cockpit seats that are easily long enough for lounging or sleeping. Simply put "Barefoot" is undoubtedly one of the best equipped and cared for Island Packets available. 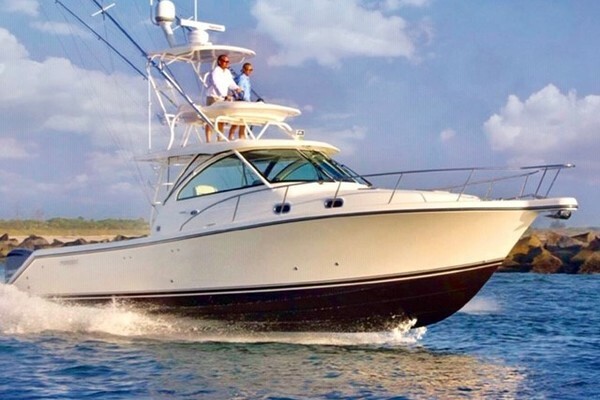 She has been continuously upgraded and her specifications read like a West Marine catalog. You will find her specs and pictures match the boat in all regards. Her experienced owners, with the last five years of cruising under their belts, look forward to sharing their knowledge of "Barefoot" with her next Captain and First Mate. We look forward to your most comprehensive review. Welcome aboard!